Among the several wonders that Spain has, Madrid is one of the best. The capital city has plenty of history and artistic treasures, together with an enjoyable daylife and nightlife. Great city, great places to visit, great nightlife, great weather and great food: a perfect combination to spend an enjoyable weekend! 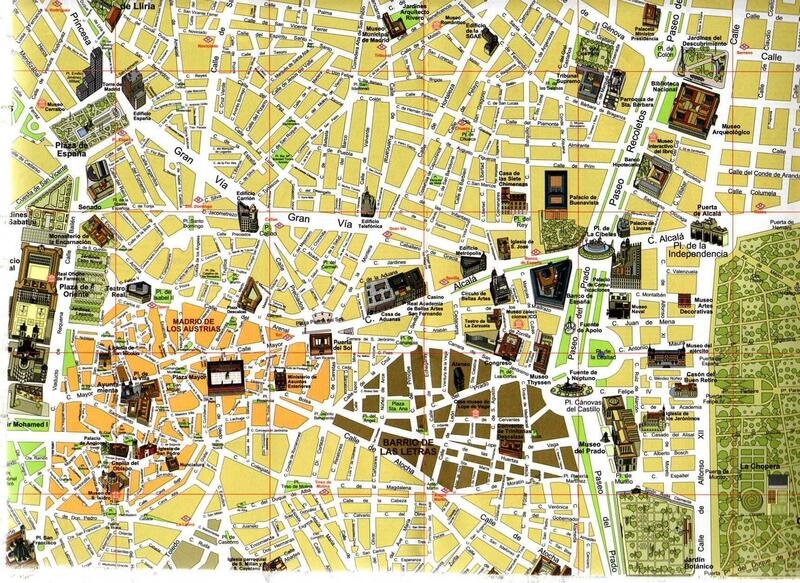 Madrid can easily be visited in 2 days, and everything is at walking distance, hence there is no need to struggle understanding how to move. The first day in Madrid can be dedicated to the visit of the city center and its main attractions. You can start your tour in Puerta del Sol. This is one of the main spots of the city and it was originally a gate in the city walls. The square hosts the famous clock that rings during the traditional eating of the 12 grapes and the beginning of the New Year. In the middle of the square is also the statue of Carlos III. Nevertheless the emblem of the square is the El Oso y el Madrono, the statue of the bear eating fruits from a tree, which is nowadays the symbol of the city. All the streets departing from Puerta del Sol are filled with stores and restaurants, so shopping lovers will find their eldorado. At 5 mins walking from Puerta del Sol you will reach another emblem of Madrid, Plaza Mayor. This wonderful rectangular square is surrounded by fantastic residential buildings. It has in total 9 accesses. In the middle of the square is the statue of Philip III. All around the perimeter there are cafes and restaurants. Enjoy a visit of Plaza Mayor and all the surrounding small streets. Next to Plaza Mayor is the famous Mercado San Miguel. This is an indoor market that became a meeting point not only to buy food but also to eat there. All the kiosks sell tapas, fish, drinks that people can enjoy on site. At every time of the day mercado San Miguel is packed with people enjoying their time there. You can have a stop there for your lunch. After a nice lunch break, we can continue the visit of Madrid by walking through Calle Mayor and passing next to the Ayuntamiento, the city hall. At the end of Calle Mayor you will find yourself next to the Royal Palace. Although the palace is not the official residence of the royal family, it is still used for official ceremonies. It is a wonderful building inspired by the palace in Versailles. Inside is a festival of Spanish art and materials: marbles, frescoes, statues. The palace is accessible for visitors. Next to the Royal Palace is Plaza de Oriente, a fantastic square formed by a big garden surrounded by statues of kings. If you go there during the day you can run into street musicians or painters. Just behind the Royal Palace are the Sabatini Gardens. The name is given in honor of an Italian architecture who contributed to the Royal Palace’s design, although he did not design the gardens. The Sabatini Gardens are in neoclassical style, with fountains, trees, flowers, statues. It is a great place to sit and relax. After a nice break in the Sabatini Gardens, you can reach Plaza de Espana. This is one of the hubs of Madrid and it consists in a big square with the statue of the writer Cervantes in the middle. On one side of the square is the Torre de Madrid, one of the highest skyscrapers in Madrid. Plaza de Espana hosts many events or mini markets. At 5 mins walking from Plaza de Espana is the Templo de Debod, an Egyptian beautiful temple that was donated to the city in the 70s. You can finish your visits by having a walk in Gran Via. This is a very long avenue mainly known as a shopping and entertainment street. You can buy whatever you need there, or go to a restaurant, to the cinema, to the theatre…Gran Via offers everything! Plus, the street is surrounded by magnificent art nouveau and art deco buildings, such as the Metropolis building, the Telefonica building and the Capitol. It is also a great place to enjoy the nightlife in the city. The second and last day in Madrid can be more relaxing. After a deserved good sleep, you can hit the road by stopping as first point in Plaza de la Cibeles. This important square hosts a fantastic neoclassical fountain in middle which is one of the symbols of the city. All around the square are important historical buildings. The square is used by the Real Madrid football team to celebrate their victories. From Plaza de la Cibeles, you arrive then in Puerta de Alcala, a big gate that previously was used as access to the city. This gate is located just next to one of the best places in Madrid: the Parque del Buen Retiro. This is a huge French-style park hosting several fountains, statues, buildings. You can spend there hours walking and relaxing and enjoying the nature and the silence around you. Once you get out of the park, you will arrive in the Musea area. Madrid has an important artistic treasure in its numerous musea. You can find there paintings and statues from Spanish, Italian, French and Flemish origins. A visit to some of them, such as Prado, Reina Sofia, Thyssen, are absolutely mandatory. All these musea are located next to each other, so foresee half a day to see all of them. Once you finish visiting the musea, you can enjoy a last attraction in the Atocha train station: a Botanic Garden. The tropical botanic garden is located just inside the station and it hosts more than 700 different species and a lake with turtles. With the visit of the Atocha station you can end your tour of Madrid. Of course if you have more time you can also visit other attractions outside Madrid, such as El Escorial, the city of Toledo, or for the football fans the Santiago Bernabeu stadium. But whatever you do, d0 not forget to enjoy the life of this city, the vibes that its people give and the activities going on.